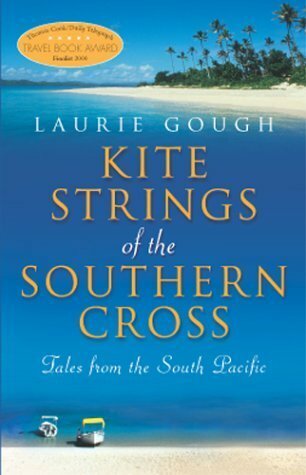 Originally published as Island of the Human Heart, Kite Strings of the Southern Cross: A Woman's Travel Odyssey retells parts of Gough's travels through Bali, Malaysia, New Zealand and Morocco through the "present day" lens of her time spent in paradise on the Fijian island Taveuni in 1994. Returning to Taveuni to reconnect with her Fijian lover, Laudi, Gough cleverly weaves a collection of short travel stories into the wider narrative of a love story during her time on Taveuni. Her relationship with Laudi extends to his wider family, including his formidable aunties, and allows her to more intimately immerse herself into the culture and idyllic island lifestyle. With time, however, she soon realises that cultural differences abound and questions whether two people from such different parts of the world can ever by truly happy together. There is no denying that Gough can write some wonderfully lyrical, almost poetical passages. Unfortunately, her constant railing against male chauvanism and different customs and religions she encounters, makes her come across as whiny, extremely opinionated and self absorbed. Too often she resorts to exaggerated and at times patronising statements that detract from the wider narrative of the book. This occurs to such an extent that I found myself physically rolling my eyes with the corniness of some of what I'd just read. Literally. There are also parts of the book where the poetic license she allows herself becomes so wide that it makes me think Kite Strings of the Southern Cross as a sort of female version of David Harris's book, The Backpacker. In similar fashion to to that book, I'm left wondering whether the retelling is entirely factual or to what degree things might have been embellished. Maybe the emphasis is more on the "less" when she states that "all the stories... are true, more or less". And without trying to engage in a session of Fisking, there are also a number of basic inaccuracies that occur within the book, which doesn't help. Which is all a pity, as Kite Strings of the Southern Cross does have a fair amount going for it, most especially when Gough describes other parts of the world she visits during the intervening period prior to arriving back at Taveuni. It is during these escapades when Gough seems to take herself less seriously that the book works best and also where her enjoyable humour is allowed free rein. But all too soon, we're dragged back to Taveuni and subjected to the cloying and indulgent travel philosophising that then spews out of its pages. Whilst I'm certain I'm not the target demographic, I'm still surprised that the book was nominated as a finalist in the Thomas Cook Travel Book Award. As mentioned, there are a number of good things to like about the book and maybe I just don't get it. But, in my opinion, this book is let down by its overall tone and only left me feeling cross about how good this book could have been.